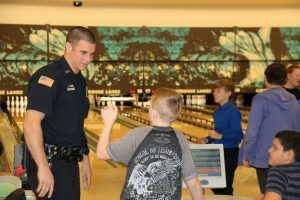 Oswego Police Officer Thomas Grover talks with students during a recent D.A.R.E. bowling event, held at Lighthouse Lanes during the hours immediately following an Oswego Middle School half day. ““We want to be promoting police officers as friends, not bullies, and helping kids and parents be more comfortable around us,” said Grover, who serves as the district’s D.A.R.E. instructor. OSWEGO – Nearly 100 students from Oswego Middle School joined members of the Oswego City Police Department at Lighthouse Lanes recently for an afternoon of bowling and pizza while building trust and finding common ground.